The farmhouse overlooks one of the most suggestive panoramas in Tuscany. Refined and elegant, the farmhouse offers its guests a truly class stay. Especially designed for couples and lovers of refined cuisine. From Volterra V1004 can enjoy a spectacular view on the “balze” and the surrounding hills can be admired from each side of the structure. Breakfast can be served in the lounge or the patio overlooking the vineyard. The pool is accompanied by tables and sun loungers. 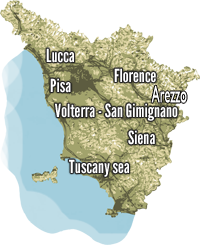 Apartments and rooms are tastefully furnished in Tuscan style, each with Jacuzzi, TV, telephone and Wi Fi . Dinner is served in the restaurant of the family in the city center, just 4 km from the farm. The kitchen and the vineyard are the great passions of the landlord and are the flagships of the company, which won the “Premio Merlot 2009″ and numerous awards for culinary guides leading the Italian scene. (Espresso, Gambero Rosso, Buon Ricordo etc. ..) The visit of the cellar or the improvised dinner on the pool are just some examples of what you can expect during your stay, the versatile chef and his wife. The photos of the structures are indicative. The allocation of rooms may not correspond to the images presented on the site, although always respecting the type of room / apartment reserved.